Of the ten mobile business intelligence (BI) questions I outlined in my last post, “Do we have an executive sponsor?” is the most important one because the success of a mobile BI journey depends on it more than any other. While the role of an executive sponsor is critical in all tech projects, several aspects of mobile BI technology make it easy for executive management to be involved closely and play a unique role. Moreover, although the CIO or the CTO plays a critical role in making sure the right technology is acquired or developed, the executive sponsorship from the business side provides the right level of partnership in order to run on all three cylinders of BI: insight into right data for the right role and at the right time. Why do you need an executive sponsor? The mobile BI strategy is in line with the overall business strategy. The required resources are made available. Necessary guidance is provided in order to stay the course. Is having an executive sponsor enough? Having an executive only on paper isn’t enough, however. How much commitment an executive sponsor makes and the leadership he/she provides has a direct impact on the outcome of the strategy. Thus, the ideal executive sponsor of a mobile BI initiative is a champion of the cause, an ardent mobile user, and the most active consumer of its assets. What makes an ideal executive sponsor for mobile BI? How does the executive champion the mobile BI initiative? First and foremost, he/she leads by example—no more printing paper copies of reports or dashboards. This means that the executive is keen not only to consume the data on mobile devices but also to apply the insight derived from these mobile assets to decisions that matter. Using the technology demonstrates firsthand the mobile mindset that sets an example for the rest of the direct reports and their teams. In addition, by recognizing the information available on these mobile BI assets as the single version of the truth, the executive provides a clear and consistent message for everyone to follow. Is mobile BI easier to adopt by executive sponsors? Without a doubt, mobile BI, just like mobility, is conducive to a wide range of users, starting with executives. Unlike the PC, which wasn’t mobile at all, and the laptop, which provided limited mobility, tablets and smartphones provide a perfect combination of mobility and convenience. This ease of use makes these devices an ideal candidate in winning over even those executives who may have been initially uneasy to include mobile BI in their arsenals or to use them in their daily decision-making activities. The mobility and simplicity may give the executives additional incentives to get involved in the development of requirements for the first set of mobile BI assets because they can easily see the benefits of having access to critical information at their fingertips. These benefits include an additional opportunity for sales and marketing to use mobile BI to showcase new products and services to customers (an approach that reflects the innovation inherent in the use of this technology). The most important goal of a mobile BI strategy is to enable faster, better-informed decision making. Executive sponsorship matters because with the right sponsorship, the mobile BI initiative will have the best chance to drive growth and profitability. Without this sponsorship—even with the most advanced technology in place—a strategy will face an uphill battle. 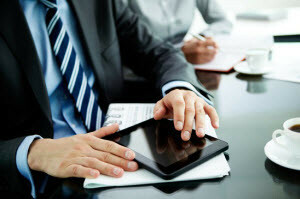 What other aspects of executive sponsorship do you see playing a role in mobile BI strategy?